Discussion in 'Eschatology - Endtimes & Prophecy Forum' started by Douggg, Mar 17, 2019. Muslims recognize the same Jesus we do. They just don't recognize Him as God. They believe He is a holy messenger/prophet of God. Well, where is the line between "same person, but some differences" ans "different person, though some similarities"? 2.Cor 11:3 But I fear, lest by any means, as the serpent beguiled Eve in his craftiness, your minds should be corrupted from the simplicity and the purity that is toward Christ. 4 For if he that comes preaches another Jesus, whom we did not preach, or [if] you receive a different spirit, which you did not receive, or a different gospel, which you did not accept, you do well to bear with [him]. 1.John 2:23 Whosoever denies the Son, the same hath not the Father: he that confesses the Son has the Father also. You didn't use the word. But the way you are connecting passages from the Bible without explaining why they should be connected in this way shows that you have a system. Or lets take your handling of the 7 (8) kings: You span them over two millenia, from Caesar to the epiphany of Jesus. There is nothing in the text that points to such a thing - you are forced to that because you set the end points such in your system. Instead a huge gap between the 7th and the 8th king, it seems wiser to set the gap visible in Daniel, when he jumps from the ascension in to the Millenium. So the kings must be either placed before the ascension or in the very last time, not in between 32 AD and, say 1900 AD (the second figure could be set higher, but I want to avoid a discussion how much higher). You are not clear in what you are asking. Are you speaking about there being 2000 years between the first five kings fallen and one is - that group of Julio-Claudian kings, then 2000years later to the end times little horn who becomes the beast? I don't have a "system" in putting everything together to make my chart. The closest thing to what you might call a system, regarding the kings (the ten kings and the 7 kings ) - is concerning the heads and horns. It is by the crowns/no crowns on the heads and horns being different in chapters 17,12, 13 according to the time stamp in each chapter. Revelation 17 - heads no crowns, horns no crowns, beast status at the time of John. Revelation 13 - heads no crowns, one head mortally wounded come back to life, horns crowns, beast status with 42 months left in the seven years. There is probably a past thread topic I made, where I went through and explained the crowns/no crowns in detail. You can use the search feature to find it. But it is also noted on my chart, in part. Here is my chart. Where am I showing a huge gap between the 7th and 8th king? I am not showing any huge gap. The time from being the little horn to becoming the beast is around 3 years. The really wise men have always understood to read the time of their ages, to discern deception from true wisdom. Others thought they were wise and foretold Jesus would come back in 1871, 1914, 1996 and so on. Or that Napoleon was the Beast, and so on. They build on sand, because they thought they could calculate the time when Jesus comes back, or the situation. it is often easier to say what the truth is not when it comes to the study of future things than what it is. I wonder if the Pharisees faced with the silence of God for the past 4 centuries were so engrained in the habit of rejecting one false messiah after another that they failed to recognise the true Messiah when He was standing right there in front of them. Putting Rev 12:3; 17:10 together, then follows Gog and Magog, ... this is a what I call a system. Much of what you say is not read out of the Bible, but rather read into it. This is not the Beast, this is the Dragon, who is not the same as the Beast, see Rev 19:20; 20:10, where their fate is somewhat different (the Dragon gets a thousand years more time before he is cast into the sea of fire). This is not just going further than Scripture, but a contradiction to Scripture. Therefore, your system, chart etc. is built on sand, not on the rock of Scripture. The Beast is an empire, or its ruler (a man), the Dragon is the ancient serpent (i.e. a spirit). You should be asking me how I get it that the dragon is seen in Revelation 12, rather than the beast, in the analysis of the crowns/no crowns. "Before" making all your accusations. The reason that God does not show you and others who use your combative interpersonal style, the understanding of the prophecies - is that He isn't going to show anyone anything, who would be blessed to receive such understanding, who would abuse such understanding to Lord it over others. Nonetheless, I am going to explain it for the sake of others here. But you need to clean up your act. In Revelation 12, John sees the red dragon (Satan) instead of the actual beast. And in Revelation 17, John also sees Satan, the scarlet colored beast, instead of the actual beast like in Revelation 13. The reason is that the actual beast is in the bottomless pit at the beginning of the 7 years which are in Revelation 12. And also in the bottomless pit in Revelation 17, at the time of John, first century. John himself cannot see into the bottomless pit. He is "told" that the beast is in the bottomless pit in Revelation 17:7 by the angel. So Satan is seen instead of the actual beast in Revelation 17 and 12. Satan is the power behind the beast. It is not until Revelation 13, that the actual beast ,currently in the bottomless pit, comes out to possess the end time person who starts out as the little horn, who goes through a series of roles before being killed and brought back to life. John himself sees the actual beast who has come out of the bottomless pit in Revelation 13. In Revelation 13:5 it says Satan gave power to the beast. Which is how to know that Satan is seen instead in Revelation 12 and 17 as the power behind the beast, while the actual beast is in the bottomless pit. I don't know if you have been watching the brexit activity in parliament the last week, but it has been astounding to watch. The UK was under the Brexit plan scheduled to leave the EU by March 29, 2019. Brexit was voted on by public referendum two years ago, and the two years to exit deadline was to provide for an orderly exit. Well, there now is anything but orderly, and has become a really big mess. There is an extension, not well defined, in theory that parliament voted for, a few days ago - but it is contingent to being approved by the EU - which is highly questionable as PM May has to go to brussels to seek the extension, that they will approve, and if there are stipulations. What has this got to do with bible prophecy? Well, there is not anything in bible prophecy, directly imo. Except the fourth kingdom in Daniel 2 will be not so unified in the end times. Also, Italy is getting rebellious, because the way the EU has to approve all the member states budgets. Which means every countries fate is in the hands of some unelected bureacrates. Which leads me think that this discontent is going to push the EU to reorganize into the ten kings, leader, form of the government of Daniel 7's fourth kingdom. I personally haven't got a specific understanding of who those 3 kings are. I think we will have to wait and watch from where we are at present. You are right. I apologize for not asking ... now I will ask. Do you mean to say that what is said of Satan (being in heaven, accusing the brothers, then losing his case and banned to earth) is to be understood as being said about the Beast? Why does Rev 17:3 speak of a beast instead of a dragon? Why does the Dragon have a different color than the beast in Rev 17? (While in our languages, German and English, it is a mater of two shades of red, in Greek there are two different colors, πυρρος and κοκκινος). Why do you think the 1260 days in V.6 are different from the 3½ times in V.14? If you think they are the same, how do you arrive at 7 years? Why does the angel say that John sees the actual Beast which will come out of the pit (Rev 17:8) when he really saw the Dragon? John himself cannot see into the bottomless pit. But can't he see things that are future in his visions? Yes, he is the one who evokes the Beast. But if you insist that it is the Beast in Rev 12, only symbolized by Satan, does that not mean the Beast evokes himself? Where it is written in Scripture that the Beast is the little horn (which is part of a vision in Daniel about the times before Christ!)? I mean, how do you arrive at that conclusion? If Northern Ireland will split from the UK, it will be united to the Irish republic. As to now, the majority wants to stay with the UK, and AFAIK almost no-one wants a new discussion about a secession. Dan 8 is about the Makedonians and the Diadochi. Daniel 8:14 is about the 3 years and ten days (=38 months and 10 days = 1150 days = 2300 lost sacrifices) when no sacrifice was slain in the (desecrated) temple, in the times of Antioch IV. "Epiphanes". Don't mix a prophecy on past things with a prophecy on future unless you have reason for that. But to the first question.... (my answer, I may have misunderstood what your are asking). Revelation 12, the first five verses are historic and identify the woman in the rest of Revelation 12 as Israel. [to take place in the 7 years, forthcoming]. To know why Satan and his angels are cast down, it is necessary to go back to Revelation 11, and the 7th trumpet sounding indicating the time has come for God to take the kingdoms of this world from under Satan's control and be turned over to Jesus. That process requires the dismantling of Satan and his angels kingdom. The sounding of the 7th trumpet is the go signal to cast Satan and his angels down to earth from heaven. Of course it is not the third heaven, where God's throne is and they were expelled from ions ago. But the second heaven, which we can call the cosmos. Which the casting down of Satan is a little after the exact midpoint, leaving him with a time, times, half time left. Anyway, Satan and his angels will be cast down to earth in the middle part of the 7 years - which the cosmos, later in the 7 years, is going to be pulled aside so the world sees Jesus before the throne of God, Revelation 6, the sixth seal event. To get to your point about the accusing of the brothers in Revelation 12:10. What that verse is about is the Jews, in the middle part of the 7 years, finally coming to belief in Jesus as the messiah and the gospel of salvation - after they are betrayed by the person they will think is the messiah at the beginning of the 7 years. 10 And I heard a loud voice saying in heaven, Now is come salvation [to the Jews], and strength, and the kingdom of our God [to the Jews], and the power of his Christ [to the Jews]: for the accuser of our brethren is cast down, which accused them before our God day and night [for the past 2000 years of their rejection of Jesus]. hemut, this is a issue that when I start explainig it, I always get some resistance from others, mainly because they have the 1260 days, the time, times, half times, the forty two months, and the 3 1/2 days (Revelation 11:11) in the wrong place on the 7 years timeline. This goes back to what we were talking about there being a number of way to interpret bible prophecy. And me saying there are million wrong interpretations possible, but only one right interpretation possible. btw, that does not mean that my interpretation is automatically right either, just because I say it. The 1260 days, "days" is the smallest unit of measure, so is the most precise. So on a 7 year timeline of 2520 days, 1260 days is precisely the mid point of the 7 years. Midpoint is different from saying middle part, or midst of the 7 years, which is more broad. *Michael and His angels battle with Satan and his angels. Satan and his angels cast down to earth. ** leaving him with a time, times, half time which we really don't know in terms of exact days or weeks. We have a rough notion that it a 3 1/2 time period. But is an error to say 3 1/2 years, as is commonly done. Okay, I will say what is commonly done - people start doing conversions, like making a cake, so many pints to a quart, so many quarts to a gallon. It is a natural tendency to do. Especially to them who first start studying Revelation. And that is fine also in most circumstances when converting months to days, and months to year. But in the unique case of Revelation, the timeframes are not "exact" equals of each other. The 1260 days is exactly half of the 7 years, 2520 days. The 42 months is a little less, than 1260 days. The time, times, half times is a little less less, than 1260 days. On my second chart, I have all the timeframes in Revelation and Daniel noted. I show why the the 42 months is actually 1256.5 days, and not 1260 days. I would suggest look at this chart closely. No where is it written directly in the text that the little horn (person) is the beast (person). That it is the same person, but in different roles, is because the little horn is judged when the Kingdom of God is brought to earth (Daniel 7:25-26) ; the little horn in Daniel 8 attempts to fight against the prince of Prices, Jesus (Daniel 8:25), and the beast in Revelation is cast into the lake of fire when Jesus returns. These are all good questions. The first one, I have a pretty firm answer for. Here you lost me. In chapter 11, we see the very end: God is called the one who is and was (Rev 11:17), not, as in the introduction (Rev 1:4) as the one who is, were, and will come. The who is is (in Greek) the same expression as in Ex 3:14, so in some Greek circles it became the starting point of speculations of God untouched by times (cf. the unmoved mover of Aristotle). The expansion to "the one who is, were, and will come" (instead of "... and will be") marks the difference to the Biblical God, who acts in history (while being eternal). The omission of "will come" in Rev 11:17 shows that God has come - Rev 11 ends with the very end, when Jesus returns. In Rev 12, it starts rather from the "beginning": The virgin of Israel (or Jerusalem, as opposed to the bride of the Lamb, the New Jerusalem, and opposed tho the Whore, the third important woman in Revelation) gives birth to the Messiah, who escaped the plots of the Dragon and goes to heaven, thus undermining the right of Satan to be there and accuse the "saints". So Satan loses the cause and is thrown out. This is very short, incromprehensible (is this the right English word?) to the outsider (probably by purpose, the book was written by one in Roman exile on Patmos! ), but anyone who knows the Gospel can fill in the gaps in that story. This is the most clear instance where the Revelation is not chronological, the order of the visions is only partly chronological, there is thematic grouping and there are different points of view (even literally: in Ch.4, Johns enter heaven, in Ch.12 he is on earth). So I see no reason why we should go to the end (ch. 11) to understand the beginning (ch. 12). 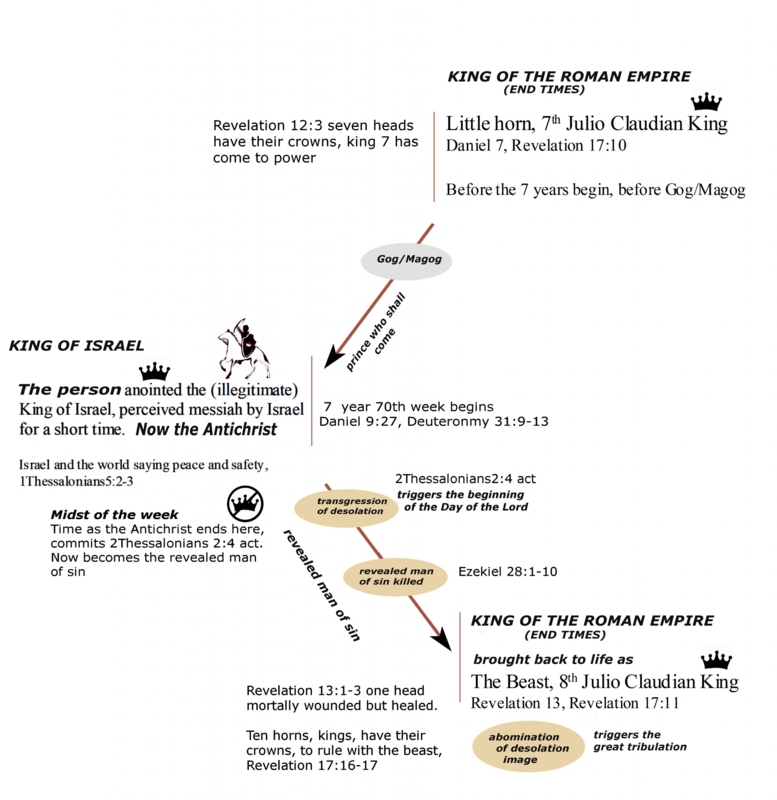 Do you believe revelation is in strict chronological order? Dan 12:1 is not about Michael fighting in heaven (the language used in Rev 12 can be understood to speak about a legal "fight", no war), it is about Michal action on earth. Dan 11 is about the diadochi, and especially about Antioch IV. "Epiphanes" (with so many details, that unbelievers call it a vaticina e eventu, a "prophecy" faked from hindsight), so Dan 12:1 is rather about the help from God the Maccabees got. I do not deny that there are links from Daniel to later times. The "abomination of desolation" was not only the altar for Zeus pigs were offered on (the abomination), it was also the head quarter of one zealotic sect fighting against rival zealots (the destruction) while the Roman beleaguered Jerusalem. I can't find that term in Revelation, which makes me cautious against any explanation it will appear a third time in the very end - this point is also linked to the question whether there will be a "third" temple made of stones, or whether the eschatological temple is a symbol for the living temple, i.e. the Church. 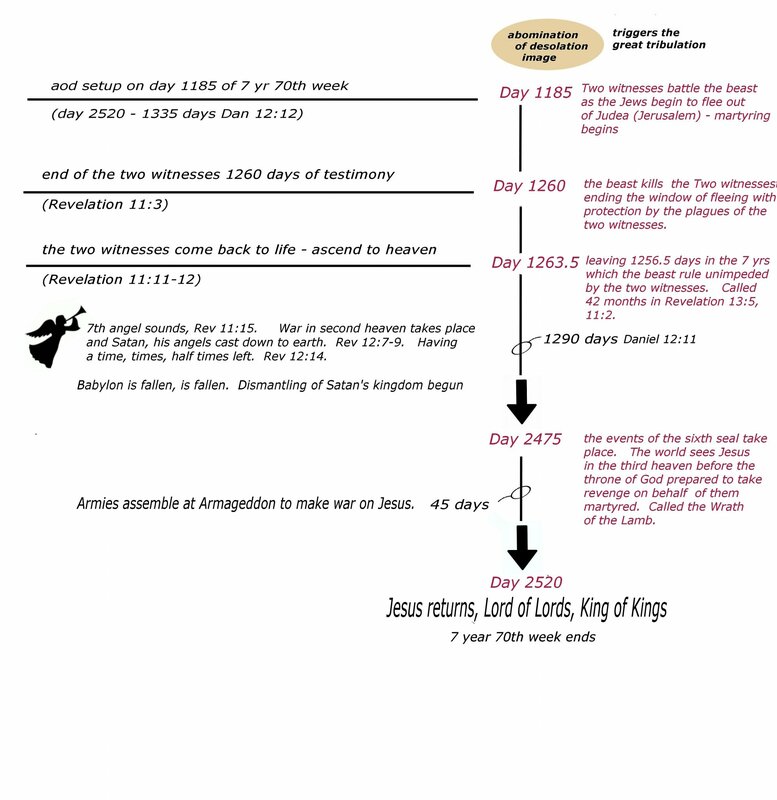 And the 3½ years = 42 months = 1260 days are, of course, to be found in revelation. I rather think this again these are instance where Daniel jumps over millennia to the very end. It is astonishing that you now leave the guidance by Daniel, who gives no hint to the first half interpreted as you do. Rev 11:3 and 12:6 are about the second half, too. Except for the first five verses in Revelation 12 which are background history, the remainder goes in the sequence of the 7 years. I am just following the sequence of the text. But is this sequence the chronological order of events? In my daily Bible readings, I'm now at 1.Sam 16. There it is said that David became an armor-bearer for Saul. But this happened after 1.Sam 17! The "semitic" way of telling stories is not our way (and since I had contacts to Wycliffe Bible Translators, aka SIL, I know that there are many "weird" ways to tell things in different cultures). John was a Jew, even one who doubts the identification with the Evangelist can see this in his Semitic-flavored language, it would be normal for him to write as he does and to refer to the same time in 12:6 and 12:14. Revelation was originally written in Greek. When it starts getting into language issues - then it gets into re-translating. And I personally don't go down that road. Because to me, the underlying reason is usually to make the text say, mean, whatever a person wants. Separately, on your 1Samuel16, 1Samuel17 issue, I think you should take that up in a different forum, imo. It's outside of eschatology. Revelation was originally written in Greek. Maybe. I once read somewhere (can't remember where) a chapter (or paper) on the language of Revelation, which immediately evoked the hypothesis in me that Revelation was written in Hebrew and then translated by the author into Greek. But this is a speculation which does not need to be discussed here, of course. But the issue is not the original language - Revelation has many "Semitisms", which shows that the author has a Semitic background (according to what I read Hebrew, not Aramaic) up to deviations from Greek grammar. This shows that a Semitic language (Hebrew, if the text I read was right) influenced his way of writing. And this has to be taken into account in exegesis. Because to me, the underlying reason is usually to make the text say, mean, whatever a person wants. This is a danger but this does not mean that we should be blind to Semitic influences. I mentioned that as a sort of background information, I chose it because it just came to my eyes this very morning, but of course I could have taken another example to illustrate non-chronological narration. An example from eschatology would raise the difficulty that one could argue that I got the chronology wrong of what was prophesied. Brexit is getting crazier...there is a you tube video that hundreds of thousands in London march for another brexit vote.